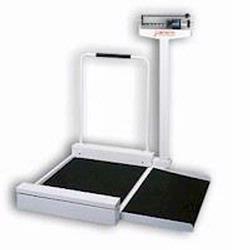 The Detecto 495 mechanical wheelchair scale provides the economical answer to weighing patients in wheelchairs. Quality is enhanced by a precision die-cast weighing beam which is easily read from either side. The weight beam is located at a height above the platform where patient or attendant can perform the weighing operation. Platform: 30 L x 26 W x 2 H with nonskid mat removable on ramp. Die cast, dual sided beam graduated in 1/4 lb increments - can be read from either side. p> Scales from us provide a 90 days replacement guarantee ONLY if the product is non functional, and customer must save original package. The ramp kit (model 3PRAMP) is detachable, allowing for the scale’s use as a stand-alone physician scale, or a kit may be attached to existing Detecto physician scales.